One night at the Lighthouse, one night in a luxury camp. What a tour! Wilderness with luxury - we carry the bulk of your gear, set up your tent and camp shower, and provide luxurious camp beds, sheets, sleeping bags, pillows and towels. 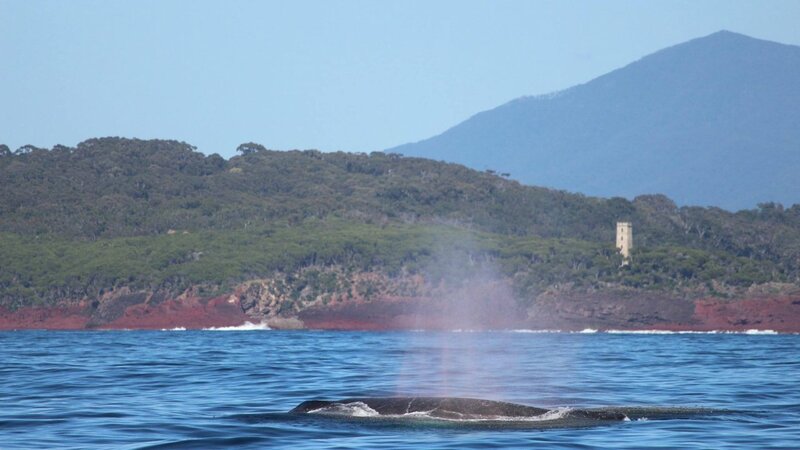 Start with a night at remote Green Cape Lightstation in unique accommodation (Queen or twin share) - Australia's best shore-based whale watching destination. 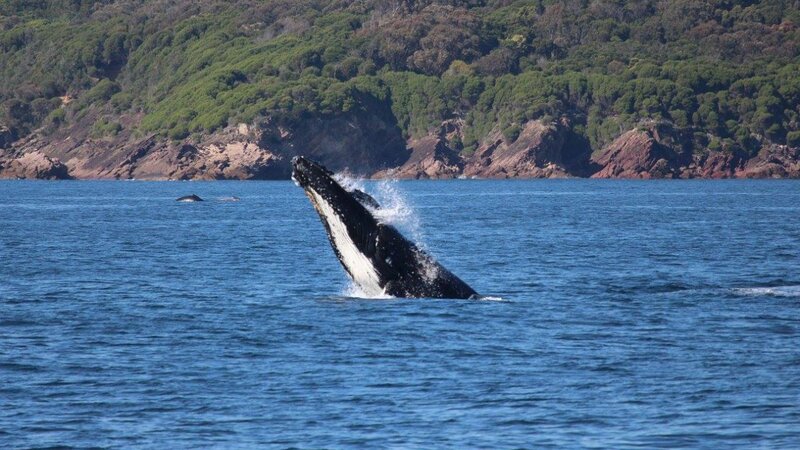 Watch migrating whales (Oct - Dec) and dolphins. Keep an eye out for rarely seen Killer Whales. The Light to Light Walk includes hidden beaches, native forest, and wild views of the magnificent Pacific Ocean. 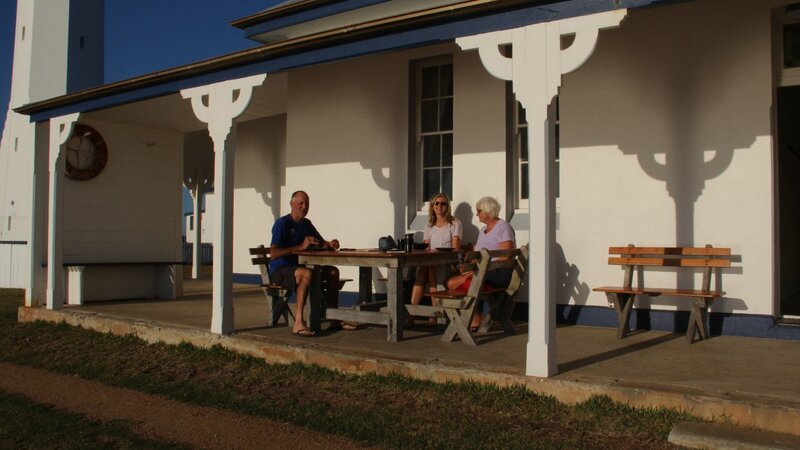 Healthy and fresh local food prepared for you, including a classic Australian barbecue, local dairy and baked goods, local meats and great Australian wines and beers. Local knowledge - we know the area, its history, and the myriad flora and fauna species you'll see along the way. The best outdoor recreation gear, including OzTent tents, sleeping bags and beds, and Mont backpacks. We top that off with memory foam mattresses and crisp white percale sheets! Capture and share photos and video of your Light to Light experience - we'll keep all your toys charged, and find mobile phone coverage for you if you need it. 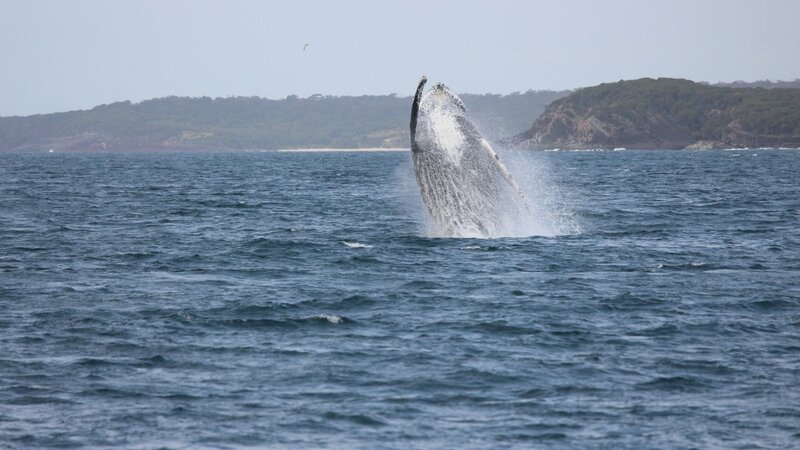 This Light to Light Tour is hugely popular during the annual humpback whale migration along Australia's South East Coast. Book quickly! 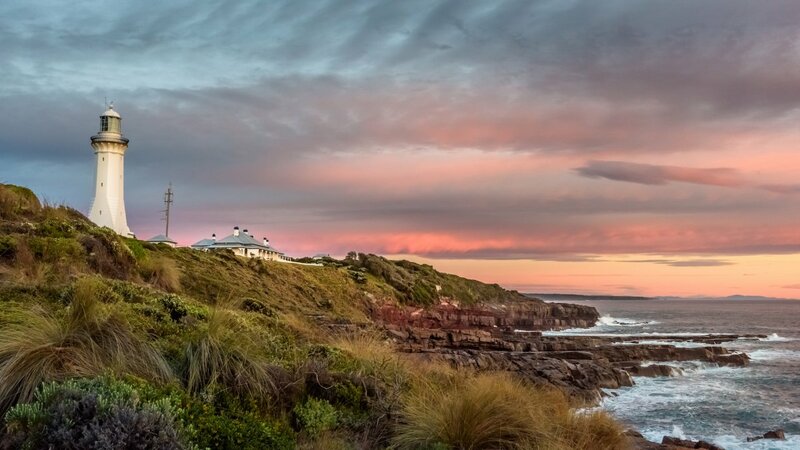 You’ll start your 2 1/2 day/2 night Light to Light Walk with a night in comfort at Green Cape Lighthouse Cottages, followed by a night in a luxury camp amongst the wildlife at Saltwater Creek. 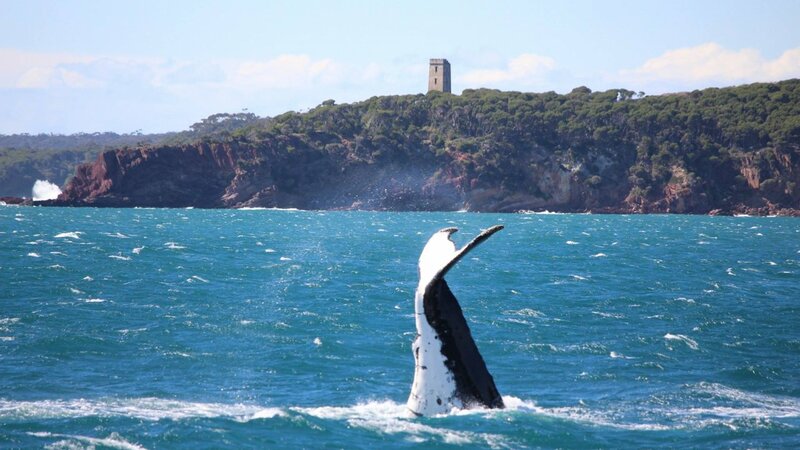 Australia Geographic named this area the best whale watching destination in the country. That night at Green Cape - one of the best vantage points in the world for land-based whale watching - makes this a wonderful tour. 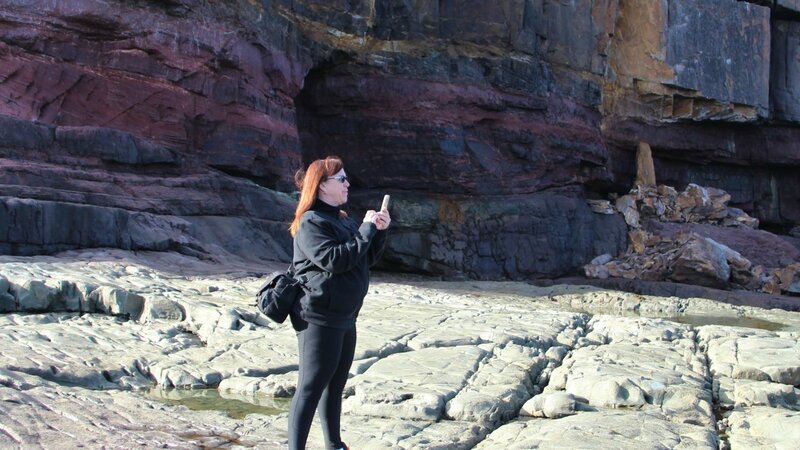 The iconic 2-day Light to Light Walk follows some of southeast Australia’s most spectacular coastline. 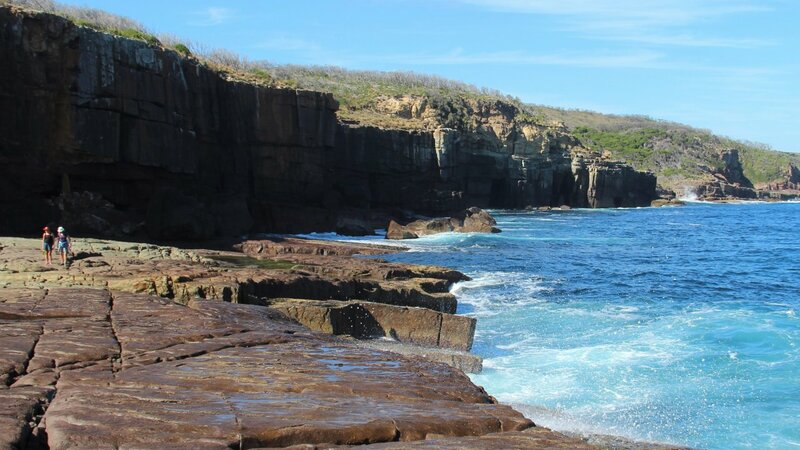 Located in Ben Boyd National Park in Australia’s Coastal Wilderness region, the 31-kilometre Light to Light Walk passes rock dating back over 400 million years, a marine environment with incomparable diversity, coastal heath and forests of Banksia and Ti-tree. And in many locations along the track you will have a clear and close view of the mighty Pacific Ocean and may even see majestic humpback whales as they slowly make their way south to Antarctica. Keep an eye out for the sound and sight of the familiar 'blow,’ or watch out for a sudden acrobatic breach, tail slap or slap of the huge pectoral fins. October and November are definitely the best months. Explore the history of whaling in this area and hear the stories of an incredible and long-lasting relationship between whalers and Killer Whales - all of which adds to the mystery and wonder of this place. Camp in luxury, walk with only a daypack and your camera. Light to Light Camps is here to support you along the way. Day #1: You'll leave your car in our carport at Kiah - 11.67km south of Eden on the way to the National Park (unless otherwise pre-arranged) and we'll leave from there around midday, so we can check into our accommodation and then go exploring around Green Cape and Pulpit Rock before settling on the verandah for a sundowner and nibbles. Dinner and sweets, coffee and chocolate to follow before last showers and bed. We'll try to wake you gently but urge everyone to be ready for breakfast around 7am, with an aim to leave by around 8:30am at the lastest. This walk takes you through low heath, into dense ti-tree forest and through tall eucalypts. You will follow a lovely creek for 3 km into Bittangabee and continue around the campsite and past the beautiful bay and beach. You'll reach your first rock platform a little north of there - enjoy the majestic views! 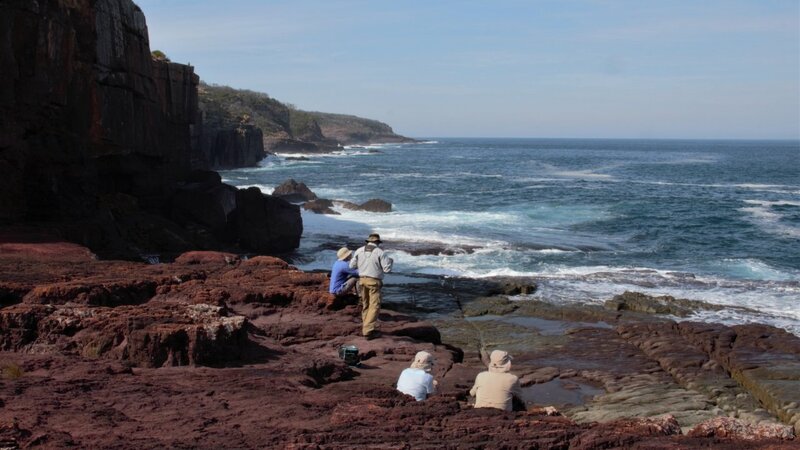 You'll finish up walking through some low heathland and down onto the magnificent Saltwater Creek (surf) beach. Take the first track to your left and into the campsite. It's only small and we'll tell you where we're set up. Put your feet up, have a hot shower, enjoy some sundowners and nibbles before dinner and sweets. Then give those weary toes a rest in a comfortable and sturdy bed. You'll wake to the sound of birds in this camp. We'll aim for you to be leaving by 9 - 9:30am so you can take your time as this next section will have you stopping for photos every few 100m. You'll be up on higher ridges and down on rocky and sandy beaches - but the views will knock you right out. You can stop for a while at the pristine Mowarry Beach before continuing on. Stop at one of the viewing points for lunch before finishing at the historic icon that is Boyds Tower (the other Lighthouse). We'll transport you to your car at our place or into town so you can get those shoes off, enjoy a long hot shower, put your feet up and enjoy the sense of achievement. We'll provide directions to our place and/or arrange for your Eden pick up on Day #1. We normally try to leave Kiah by lunchtime so we have more time to explore at Green Cape. Walking shoes or boots – preferably worn in for comfort. Old worn-in runners are better to walk in than brand new walking shoes. A camera, smart phone or some other device to take photos. T-shirt and long-sleeved top. Go for quick-drying fabrics such as lightweight merino, which keep you cool and dry, but is also a very effective barrier against the cold. Layers are the best. Walking pants – preferably those with zip-off legs (and/or shorts). Jeans are not suitable. 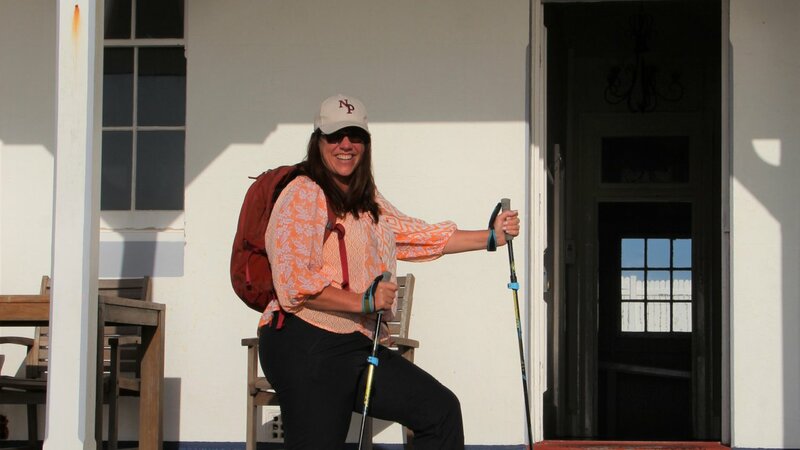 Sunhat or cap, beanie and gloves for cool nights, walking socks, and comfy soft shoes for around the camp. This includes ugg boots or slippers! Remember you will be in an out of a tent so lace ups aren't great in camp. A warm coat for cooler weather. Choose merino or polar fleece if possible. Remember, you only carry a light daypack with snacks, water and bare necessities - we carry and set up all the camping gear! 1 night: Twin share in OzTent RV-5, on comfortable padded camp beds, topped with an OzTent mattress, fully lined OzTent sleeping bag and crisp white fine cotton percale sheets. Sturdy OzTent camp chairs, and a side table for meals or drinks. Thick, fluffy bath sheets, flannel face washer, and Pure Herbs shampoo, conditioner and body lotion. Fresh, filtered rainwater in Nalgene BPA-free 1 litre bottles. Hand held ResQ Link Personal Location Beacon (registered with Australian Marine Safety Authority). Maps, notes and interpretive information about the Light to Light Walk and the region. All National Parks camping, visiting and accommodation fees. Tea and coffee whenever you want it. 2 x glasses quality wine (red or white) or 2 x beers per person per night. Additional available for purchase. Unlimited fresh fruit juice or sparkling water. Hot shower in a Joocla purpose-built ensuite tent. Twin share in OzTent RV-5, on comfortable padded camp beds, topped with an OzTent mattress, fully lined OzTent sleeping bag and crisp white fine cotton percale sheets. Thick, fluffy bath sheets, flannel face washer, and quality toiletries. 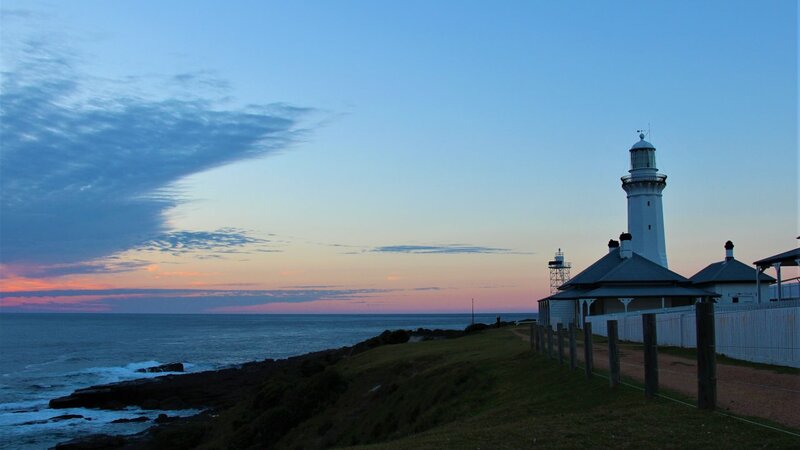 PLEASE NOTE: Bookings in both Green Cape Lightstation cottage/s and/or Saltwater Creek and Bittangabee Campsites are reliant on the booking system for NSW National Parks & Wildlife Service. Whilst we do our best to work within these conditions, we ask your understanding if the National Parks system fails and our booking/s are cancelled. In this case - of course - all monies paid to us would be fully refunded or credited to a booking an another date. If you wish to book a tour less than 30 days from commencement date, please contact us via email: bookings@lighttolightcamps.com.au or phone +61 2 429 961 047. We will then confirm accommodation availability and respond to you immediately. THANK YOU FOR UNDERSTANDING. We like to tailor our tours to create an experience that matches your interests. 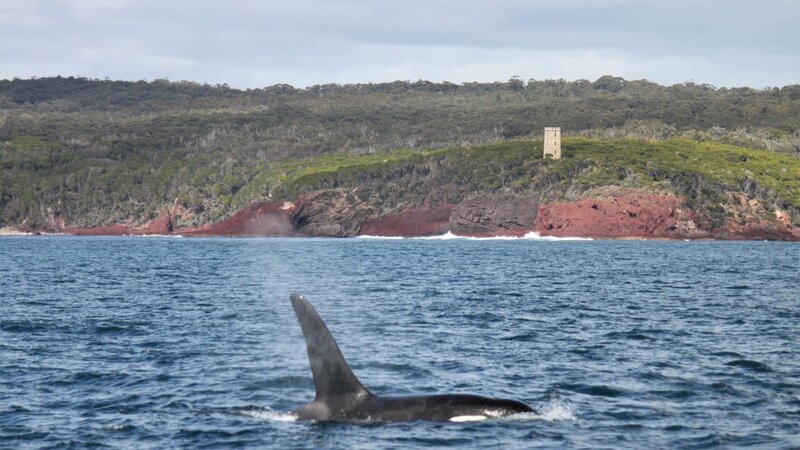 Whether it's whale-watching, seal-watching, a love of lighthouses, star-gazing, bird-watching, fishing, Aboriginal history, or marine science - if you have a special interest you'd like to explore while in the region let us know. We can work with you on ways to make sure your Light to Light experience is designed specially with you in mind. This tour is best suited for adults, but if you have children you would love to bring along, talk to us. We're flexible and creative, and might be able to offer a solution that works for both you and your youngsters. Ahead of your tour, we'll be watching the weather forecast closely. If a tour is cancelled by Light to Light Camps due to unfavourable conditions, a full refund will be provided. All cancellations must be made in writing and sent to: bookings@lighttolightcamps.com.au or Light to Light Camps, 1167 Princes Highway, Kiah, NSW, 2551. These cancellation fees are not negotiable.